Blog The Caravaggio Letter: Eyewitness account of the Linder Gallery? There is an intriguing letter in the university library of Urbino recently uncovered by Alexander Marr that provides a direct eyewitness account of the Linder Gallery from shortly after its creation. It was sent in March 1629 by an engineer, Giovanni Battista Caravaggio to his mathematical tutor, Mutio Oddi, describing a visit to the house of the German merchant Peter Linder. Three days ago, spurred on in part by my duty and in part by curiosity, I went to visit Signor Pietro Linder […]. He offered to show me various beautiful objects in his study, where, as well as the little ivory statues and others of less noble material, and the casket arranged beautifully with various mathematical instruments, I saw in particular, among many other paintings which had appeared since I was there last, a painting of decent size in which a gallery is shown in perspective, adorned with various paintings, depicted with no less study than skill, both in the extreme diligence used in them, and in that one can see there the styles of different individual painters imitated. Three tables are then depicted in a well-proportioned position, on which are various beautifully feigned mathematical instruments, concave mirrors, crystal lenses, pieces of prints, demonstrations and mathematical figures, and finally various medals, among which I saw the one with the image of your Lordship represented there with better fortune than the good Signor Pietro had with the cast, as in addition to displaying an extremely good likeness of your Lordship, there are also the letters that spell your name, carried out with such precision that, however small they may be, they can be read without difficulty. In sum it appeared to be that this painting, both for the inventione, which I understood to be in a large part due to your Lordship, and for the work, was worthy of the cabinet of any great prince. First, can we be sure he is really talking about the same painting? Although he describes the three tables and the astronomical instruments in detail, it seems strange that Caravaggio (not to be confused with the famous painter) makes no mention of the two figures — the bearded old man and the woman — dominating the foreground. Could it be that the allegorical figures were added later? Technical analysis makes that seem very unlikely. Given that Caravaggio cites Linder as the owner of the painting, and the Linder coat of arms appear in the upper left-hand window of the painting it seems pretty certain that he is describing this painting. Second, Caravaggio suggests that his tutor the Urbino mathematician Muzio Oddi had a very important role in the “invention” of the painting. He also mentions that Oddi’s portrait medal is included in the painting. Close inspection of the Linder Gallery painting reveals Oddi’s portait on the octagonal table, the darkest and most illegible of all the medals (see the zoomable detail of the Green Table in particular). Oddi would appear to be a key figure in coming up with the strong mathematical emphasis of the painting (though curiously Oddi is not known to have had any particular interest in Kepler — strange given the strong references to Kepler in the painting). 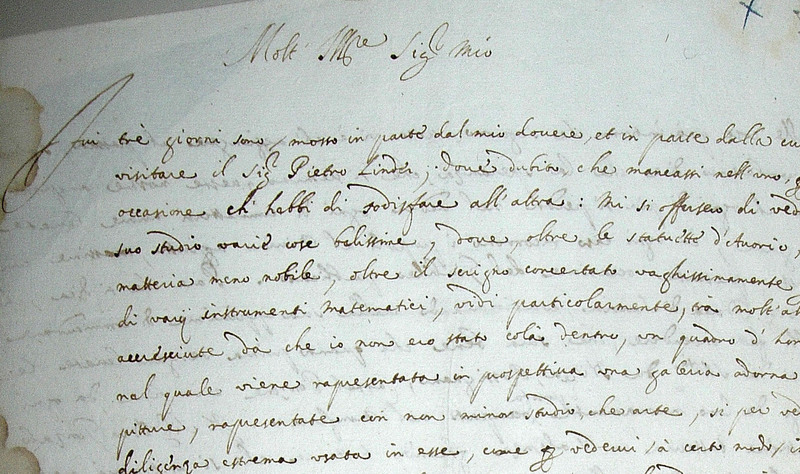 Third, Caravaggio’s letter helps us date the completion of the painting. There are two objects represented in the painting that date from 1627 (Kepler’s Rudolphine Tables and the Muzio Oddi portrait medal) so it seems likely that the painting was completed between 1627 and 1629, while it may have been commenced well before then. It is of course possible that the painting was completed by a different artist to the artist who commenced it (gallery interiors were frequently collaborative works). It is somewhat frustrating that Caravaggio doesn’t bother to mention the name of the artist in his lengthy description of the Linder Gallery. His letter does demonstrate clearly that the artist wasn’t working in isolation but in close consultation with at least two other people — merchant and collector Peter Linder and mathematician Muzio Oddi.